A Cushite officer at the court of King Zedekiah, who interceded in behalf of Jeremiah, and was sent by the king with thirty (Ewald and Duhm, "three") men to draw up the prophet from the pit (A. V. "dungeon") into which he had been cast by order of the princes (Jer. xxxviii. 4-13). For this deliverance Ebed-melech was prophetically assured of safety in the general overthrow of Zedekiah (ib. 16-18). The name occurs in the Phenician inscription, "C. I. S." i. 46, 3 (Lidzbarski, in "Handbuch der Nordsemitischen Epigraphik," p. 334; see also Grey, "Hebrew Proper Names," pp. 117, 147). Ebed-melech is the hero of popular legend. According to "The Rest of the Words of Baruch,"published by J. Rendel Harris in Greek under the title Tὰ Παραλείπομενα Ιερεμίου τοὺ Προφητὸυ(Cambridge, 1889), Ebed-melech slept under a tree during the sixty-six years which elapsed between the destruction of the Temple in the month of Ab and the return of the exiles from Babylonia on the 12th of Nisan; during all this time the figs in the basket which Jeremiah had sent him to carry to the sick in Jerusalem remained fresh as when first put there. Ebed-melech is also counted among the nine persons who entered paradise alive ("Masseket Derek Ereẓ," i., ed. Taurogi, p. 8; "Alphabeticum Siracidis," ed. Steinschneider, pp. 27 et seq. ; comp. "J. Q. R." v. 409-419). 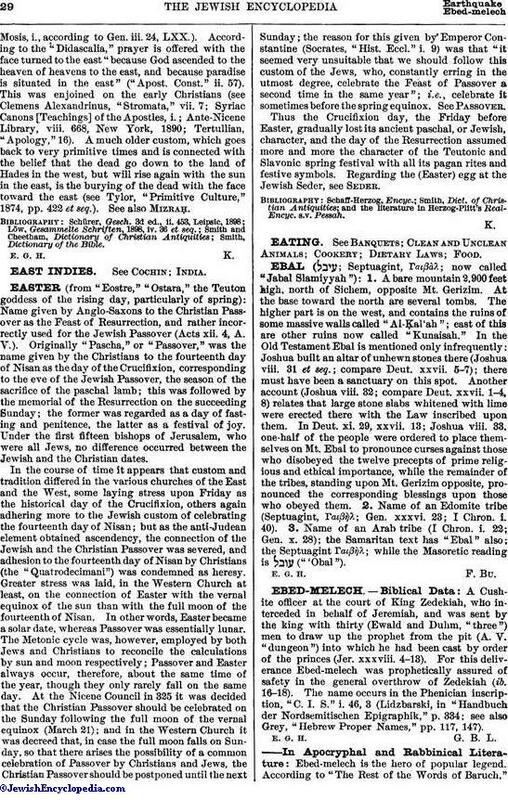 There is a disagreement among rabbinical writers as to the identification of Ebed-melech. Jonathan b. Uzziel rendered the name "the servant of the king," considering "ha-Kushi" to apply to Zedekiah. This interpretation was adopted by the Talmudists (M. Ḳ. 16b). But the Talmud does not state who the servant of Zedekiah was. In Pirḳe Rabbi Eliezer liii. (see also Pesiḳ. R., ed. 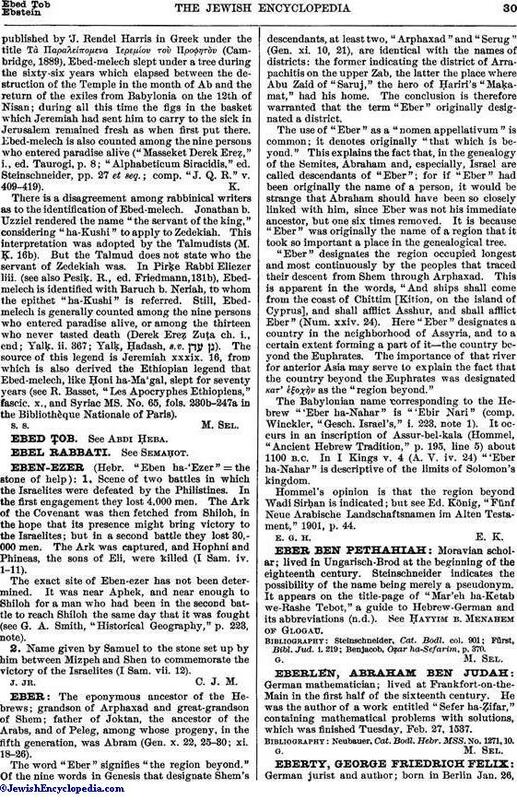 Friedmann, 131b), Ebedmelech is identified with Baruch b. Neriah, to whom the epithet "ha-Kushi" is referred. Still, Ebedmelech is generally counted among the nine persons who entered paradise alive, or among the thirteen who never tasted death (Derek Ereẓ Zuṭa ch. i., end; Yalḳ. ii. 367; Yalḳ, Ḥadash, s.v. ). The source of this legend is Jeremiah xxxix. 16, from which is also derived the Ethiopian legend that Ebed-melech, like Ḥoni ha-Ma'gal, slept for seventy years (see R. Basset, "Les Apocryphes Ethiopiens," fascic. x., and Syriac MS. No. 65, fols. 230b-247a in the Bibliothèque Nationale of Paris).